23:30 That's it from the live updates today. Some sporadic violence is being reported in Egyptian governorates, with four people confirmed dead, but in Cairo things are still peaceful. The mood in Tahrir Square and at Ittihadiya presidential palace is jubilant - although the campaigns against sexual harassment are warning on Twitter that sexual assaults are taking place in Tahrir. 23:25 More clashes being reported outside Cairo. There is violence in Kafr El-Sheikh in the Nile Delta, which has led to 118 injured so far, Ahram Arabic reported two hours ago. Clashes between opposition and Morsi supporters started at 7pm. Forty-three Morsi supporters taking part in the clashes were arrested for illegal possession of weapons. Despite the clashes, cheering crowds flooded the streets of Kafr El-Sheikh immediately after El-Sisi’s statement. 23:20 The clashes in Marsa Matrouh seem to have worsened. The city, on the western part of Egypt’s Mediterranean coast, is known to be an Islamist stronghold. Health ministry officials confirmed that 4 people have died in the violence and 13 are injured. According to an Ahram correspondent based in the city, Morsi supporters attacked the governorate headquarters after El-Sisi's statement, leading to clashes. 23:10 Ahram Online's Bassem Abou El-Abbas is at the Rabaa Al-Adawiya pro-Morsi sit-in in Cairo. He says the mood is angry but not violent; the area is surrounded by troops who are not allowing anyone to enter or leave the sit-in. Eyewitnesses told El-Abbas that after the military's announcement, three cars' windows were smashed, but that seems to be the extent of the violence. He says that the army which is surrounding the protest is not allowing anyone to enter or leave the sit-in. 23:00 A celebratory statement has been released by revolutionary group the April 6 Youth Movement which hails the role of the military. The statement said that ousting Morsi is a continuation of the January 25 revolution. “Today the demands of the people have been met...the statement of the armed forces coincided with the demands of the people, and the proposal of the political forces and that of April 6, which it had put forward in July,” it read. The youth group called on everyone to “recognise the importance of cooperation for the sake of the country and to avoid the mistakes of the past such as monopolising decision making.” It also called on people to maintain peacefulness and avoid any bloodshed or incitement. The group also highlighted the importance of the role of the armed forces in keeping Egypt united and hailed it for not involving itself in political life. 22:50 We're getting reports of some violence in governorates outside Egypt. MENA reports that there are clashes between pro-Morsi groups and army forces in the governorate of Marsa Matrouh on the north coast. 22:40 Bashar Al-Assad, president of Syria, has said that events in Egypt are "the fall of what is called political Islam," reports Reuters. Morsi and the Muslim Brotherhood had been vocal opponents of the Syrian president, calling for foreign intervention against him. 22:35 Head of the High Constitutional Court Adly Mansour will take the oath of office on Thursday, becoming Egypt's new president. 22:30 The 'Rebel' campaign, the anti-Morsi signature drive that called for the nationwide protests that led to his ouster, invited the youth of the Muslim Brotherhood in a Facebook statement, to "rejoin to the lines of the people and not to be driven by calls for violence or terrorism." 22:15 Live footage shows thousands of Morsi's supporters gathered in front of Cairo University to protest the army's announcement. Yasser Soliman, a supporter of Morsi, said the military's announcement is an implicit call for civil war. "The army chose to appease one part of the population against the other. They [the military] are basically setting the streets on fire, calling for civil war. These people [Morsi's supporters] are willing to sacrifice their life in this situation," Soliman said in a live interview with Al Jazeera International, speaking from in front of Cairo University. "No other president could have solved the economy's problems in one year. His opponents used violence to pressure him; why didn’t they just wait for next elections?" he continued. 22:10 Nader Bakkar, spokesperson of the Salafist Nour Party, says on his official Twitter account that his party has taken part in setting the new transition roadmap which removed Morsi from the presidency. Leading Freedom and Justice Party member Islam Abdel-Fattah responded to Bakkar’s statement calling the Salafist Party "traitors." The Nour Party, formerly allies of Morsi and the Brotherhood, have distanced themselves in recent months. 22:00 The interior ministry has released a statement upholding the army's announcement. The statement says that the army's roadmap fulfills "the people’s will and their interests" and stressed that the police stand by the armed forces in efforts to achieve the country’s security and stability. There has clearly been a lot of coordination between the military and the police over recent days, as shown in supportive statements like these. 21:55 The Islamist-run television channels that were taken off air were apparently also evacuated by police, reports Ahram Arabic. Police forces went to the Media Production City in Cairo's 6 October satellite city, where the offices and studios of these channels are located, and evacuated them. The police also arrested some of the staff working for these channels. 21:52 Mohamed Morsi has announced on the official Facebook page of the presidency that the announcement made by the armed forces is a coup and that he rejects it. He said that as president and head of the armed forces he calls on all civil and military citizens to abide by constitution and law and not respond to the coup. 21:50 The official website of the Muslim Brotherhood, Ikhwan Online, writes that the military’s announcement is a "conspiracy against legitimacy, a military coup that wastes popular will and brings Egypt back to despotism." The statement continued: "Religious scholars condemn the coup and affirm the necessity of upholding the elected president. Symbols of the defunct regime are coming back to the scene at the expense of the blood of the martyrs of the 25 January." 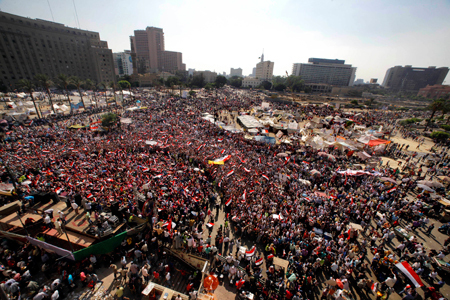 The statement also claimed that "millions in many squares in Egypt have started a sit-in in support of legitimacy." The website also reported that armed forces, deployed a few hours ago around Rabaa Al-Adawiya Mosque, are personally searching everyone getting into the pro-Morsi sit-in and preventing people from chanting in support of Morsi except after they’re inside the square. 21:34 The head of Egypt's High Constitutional Court, the most senior Egyptian court, is Adly Mansour. He was promoted to the position in June. 21:32 Attendees at the press conference where El-Sisi gave his speech included a number of top military and police officials who sat in two rows on either side of the podium; the Coptic Orthodox patriarch Tawadros II; the grand imam of Al-Azhar, Ahmed El-Tayyeb; ElBaradei; a representative of Nour Party; Mohamed Abdel-Aziz, one of the anti-Morsi Rebel campaign's founders; and a senior judicial figure. 21:30 Liberal politician Mohamed ElBaradei spoke at the army-held press conference. He says the roadmap drawn up by the military will guarantee the fulfillment of Egyptians' main demand – early presidential elections. "I hope that will mark the beginning of a new era for the 2011 January revolution," he added. 21:28 The grand sheikh of Al-Azhar said that he supported the call for early presidential elections based on an Islamic precept that the better of two evils is a religious duty,. Accordingly, those gathered decided to hold early presidential elections, their fairness guaranteed by the judiciary, the armed forces and the police. 21:25 The Brotherhood's FJP just tweeted "history will tell that the first decision of the military coup, in which the advocates of democracy participated, is putting off air all opposition channels," a reference to the Brotherhood's channel and other Islamist owned channels being blacked out after El-Sisi's announcement. 21:22 At the press conference where El-Sisi spoke a few moments ago, Grand Imam of Al-Azhar, Ahmed El-Tayyeb, is speaking, followed by Coptic Orthodox Patriarch Tawadros II. 21:20 It looks like several other Islamist-run channels including Hafez and Al-Nas are off air. 21:18 The Morsi supporters in their thousands at Rabaa Al-Adawiya are defiant. 21:15 El-Sisi's speech specified that the constitution will be suspended temporarily; the head of the High Constitutional Court will take over the presidency and have power until early presidential elections, that will be followed by parliamentary elections - dates as yet unspecified - and there will be a national technocratic cabinet formed. A parliamentary elections law will be reviewed by the HCC to stage parliamentary elections; there will be a committee formed to amend controversial articles in the temporarily suspended constitution; there will be a media code of ethics to guarantee the media’s professionality; and a committee for national reconciliation will be formed. 21:12 It looks like Misr 25, the Egyptian Brotherhood-run television channel, is off air. 21:10 The speech is over. 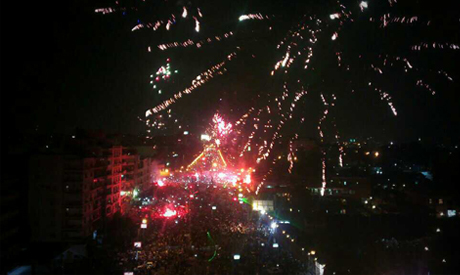 There are massive celebrations going on at anti-Morsi rallies in Tahrir Square and Ittihadiya presidential palace in Cairo. However, the president's address did not live up to the expectations of the Egyptian people. We salute the armed forces for their repeated sacrifices for the sake of the county. 21:02 Here we go. 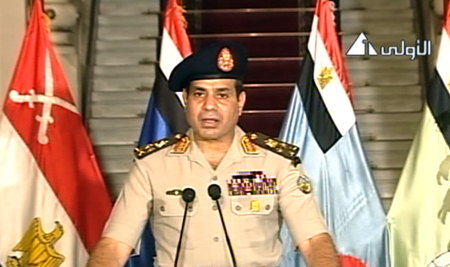 Chief of Egyptian armed forces, Abdel-Fattah El-Sisi, is speaking live on Egyptian television. 20:55 Another statement by an opposition group, clearly anticipating an announcement that meets their demands. The 30 June Coordinating Committee, a coalition of anti-Morsi groups, releases a statement refusing any foreign pressures exerted on the armed forces to pull it away from the popular movement and portray its stance as a coup. It also rejects attempts by the Muslim Brotherhood and its allies to abort the “popular revolution” which went to the streets in the millions. The statement declared its rejection of what it describes as the US "standing by the Muslim Brotherhood for its own interests." The current unprecedented popular movement is a continuation of the January 25 revolution, the statement asserted, and “will achieve its goals of justice and dignity by the struggle of its people”. “We call on national forces to remain united in its path in the face of any attempt to divide” the statement read. 20:50 A presidential source tells Ahram Arabic that President Mohamed Morsi was informed by the army at 7pm that he is no longer president. 20:40 The moderate Islamist grouping the Strong Egypt Party, led by former Muslim Brotherhood figure Abdel-Moneim Abu-Fotouh, said on its official Twitter page that it rejects any attempts by the army to interfere in managing the political process and that it also rejects the exclusion of any political faction from public life. 20:35 Several rights organisations in Egypt have released a statement on Wednesday declaring their respect for the 30 June uprising and urging that the law must be the basis for resolving the current political situation. The statement also called on security forces, including the military, to protect demonstrators and “act decisively” with any person attacking demonstrations regardless of political affiliation. Finally, the groups demanded that any new political roadmap should guarantee civil liberties, and should lead to constitutional amendments. The statement’s signatories include the Cairo Institute for Human Rights Studies, the Arabic Network for Human Rights Information, the Egyptian Organisation for Human Rights, the Hisham Mubarak Law Center, and a number of others. 20:30 Maha Abou Bakr, a senior member of the anti-Morsi ‘Rebel’ campaign, tells Ahram Arabic that the group has suggested Mohamed Ghoneim, a founding member of the Egyptian Social Democratic Party, to head the national coalition government that they expect to be formed following Morsi’s ouster. 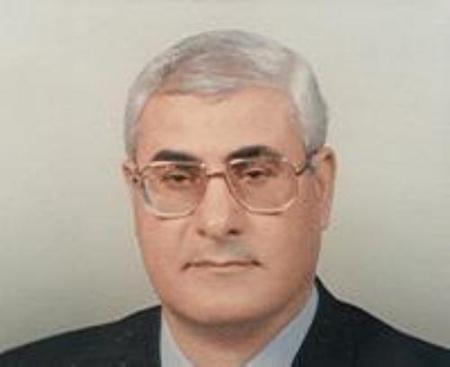 Bakr further added that the movement has nominated leftist politician Hossam Eissa to be one of two deputy prime ministers, suggesting that the second deputy be a member of the Islamist current. 20:20 Egypt’s military spokesman Ahmed Ali has said on his official Facebook page that the meeting between the army’s commander-in-chief Abdel-Fattah El-Sisi and the religious and national groups has ended. A statement revealing meeting’s outcome will be coming within the hour. 20:15 Fireworks are lighting up the sky in the streets near to Ittihadiya presidential palace, reports Ahram Online’s Bel Trew. “People are singing and dancing, and some are holding posters of military figures chanting ‘the heroes are here,’ ” adds Trew. 20:10 Mohamed El-Beltagy, deputy head of the Freedom and Justice Party, gave an angry statement to Al Jazeera English from the pro-Morsi rally Rabaa Al-Adawiya Square. El-Beltagy condemned the military’s statement and rejected the army’s interference in the political crisis. "Pentagon press secretary George Little is refusing to release any details about the content of the calls. He says U.S. officials at various levels of government have been very clear that America remains committed to the democratic process in Egypt and hopes the tensions there can be resolved peacefully." The US State Department press conference is still ongoing. Spokesperson Jen Psaki says that the US is "on the side of the Egyptian people" and that Morsi should call for an end to violence. 19:40 At a press conference, a US State Department spokesperson says that the United States is "very concerned" about the situation in Egypt. The situation in Egypt remains fluid, and the United States cannot confirm whether a military coup is underway, department spokesperson Jen Psaki told reporters. "We do ... remain very concerned about what we're seeing on the ground," Psaki said. In Sinai, Egyptian security forces have been on high alert along the borders since the morning, according to Ahram Arabic. Security measures have also been tightened up near the tunnels into Gaza and around security installations in the deserted peninsula. The minister of foreign affairs resigned yesterday. 19:20 The pro-Morsi coalition, the National Alliance to Support Legitimacy, will hold a press conference on the latest developments tonight at 10pm in Al-Rabaa Al-Adawiya, according to the Muslim Brotherhood’s Twitter account @Ikhwanweb. 19:10 The official spokesman of the armed forces, Colonel Ahmed Ali, vehemently denies that the troops currently deployed in Cairo have attacked pro-Morsi protesters, who are camping out at Rabaa Al-Adawiya Mosque in Cairo's Nasr City district. He said that some people had claimed that the army had attacked the rally in phonecalls to CNN. "Our army is seeking to secure all Egyptians, regardless of their affiliations. We call on local and international media not to spread any inaccurate information that may drive a wedge between the army and the people," he said on his Facebook page. 19:00 At least ten people have been injured in clashes between supporters and opponents to President Morsi in Al-Shohada Square in the Nile delta governorate of Kafr El-Sheikh, reports Ahram Arabic. The injuries were reportedly caused by bird shot and bladed weapons. The injured have been transferred to local hospitals. 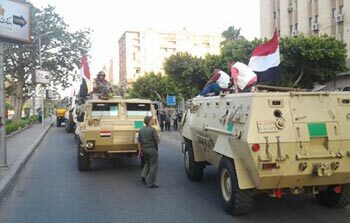 18:55 Military sources have told Ahram Arabic that a large number of military armoured vehicles are now deployed in the vicinity of the Ittihadiya presidential palace, the nearby Rabaa Al-Adawiya Mosque, and the iconic Tahrir Square, where rallies are being staged. The interior ministry’s Central Security Forces are also stepping up their presence around Tahrir Square and at key state institutions. 18:50 Lots of reports of army deployments around Cairo now. Alastair Beach of UK daily the Independent is tweeting pictures of troops being deployed close to Cairo University in Giza, the site of yesterday's clashes, including along the Nile Bridge connecting Giza and Cairo. There are also now reportedly troops deployed in Tahrir Square and at the Rabaa Al-Adawiya pro-Morsi rally. 18:45 Military sources have told Ahram Online that the meeting being held between the leaders of the armed forces and political, religious and national groups is over and a statement will be released shortly. 18:40 Around a hundred Turkish protesters have gathered in Istanbul to voice their support for Egyptian President Mohamed Morsi, reported state-owned news agency MENA. The protest was reportedly led by the Özgür-Der, a Turkish rights group. 18:35 Protests in the Nile Delta are still going strong, with hundreds of thousands rallying in iconic Thawra Square in the city of Mansoura in Daqahliya, Ahram Arabic reports. "The people already brought down the regime," protesters chanted. "Mansoura will turn you back into a banned group," went another in reference to the fact that the Muslim Brotherhood was forced to operate underground under former president Hosni Mubarak. Protesters across the town continue to blockade a number of state institutions, in the fourth consecutive day of their civil disobedience campaign. 18:30 An article on Ahram Arabic website quotes an anonymous source saying that the armed forces have extended their deadline in an effort to reach consensus and prevent further violence. The source explained that military leaders offered to postpone their statement for a few hours in order to cooperate on containing bloodshed and to guarantee the president's safety. 18:20 The military are being deployed to separate the pro-Morsi protesters at Rabaa Al-Adawiya Mosque and the anti-Morsi demonstrators in front of the headquarters of the Ittihadiya presidential guard, reports Ahram Arabic. 18:15 Egyptian security forces have imposed a travel ban on President Morsi, Muslim Brotherhood chief Mohammed Badie and his deputy Khairat Al-Shater over their involvement in prison escapes in 2011, security officials have told AFP news agency. 18:10 In anticipation of the military's statement, anti-Morsi protesters are crowding Tahrir Square and Ittihadiya presidential palace. Both spaces look full. There are also hundreds of thousands of Morsi's supporters at Rabaa Al-Adawiya Mosque in Nasr City. Everyone is waiting for the statement. 18:00 There is a report on Ahram Arabic website that the army is beginning to deploy in Giza from the Dahshour barracks. There are lots of rumours circulating and it's hard to verify sources, although it's true that Giza was the site of deadly clashes yesterday. 17:50 The anti-Morsi Rebel petition campaign has called on people to take the streets before the army announces its statement, expected soon. Ahram Arabic reports that the campaign called on people to have faith in God, the people and the army, stressing that the military does not seek to get involved in politics. The campaign expressed its faith in the expected military statement saying it believed it will reflect the demands of the people. ‘Rebel’ reiterated the army warning against any possible killing of civilians saying that anyone caught involved would stand trial and would be held accountable by the people. The campaign also added that it would stand against any foreign pressure, especially from the US, to leave Morsi in power. "Hundreds of thousands of them have gathered in support of democracy and the Presidency. And they will not leave in the face of this attack. To move them, there will have to be violence. It will either come from the army, the police, or the hired mercenaries. Either way there will be considerable bloodshed." "Yesterday, the President received an initiative from an alliance of parties supporting constitutional legitimacy. He discussed it with the Prime Minister and the Minister of Defense and all three of them agreed that it presented an excellent path for Egypt out of its current impasse. The initiative called for a full change of cabinet, a prime minister acceptable to all, changing the public prosecutor, agreement on constitutional amendments, and a reconciliation commission." "And let us also be clear. The President did not have to offer all these concessions. In a democracy, there are simple consequences for the situation we see in Egypt: the President loses the next election or his party gets penalized in the upcoming parliamentary elections. Anything else is mob rule." 17:36 More anti-Morsi protests in the Nile Delta. In Sharqiya, President Morsi’s hometown, crowds of protesters are congregating outside the president’s residence there, chanting anti-regime slogans. Protesters say they will begin an open-ended sit-in until their demands are met, threatening to bring the whole city to a halt. Other demonstrators continue to shut down entrances to the municipal governor's office, banning employees from entering. 17:35 Twenty people were injured after clashes between pro- and anti-Morsi protesters in the northern Delta governorate of Damietta near Souq Al-Hassaba Square, reports Ahram Arabic. 17:30 Opposition leader Hamdeen Sabbahi has called on all Egyptians to rally in the streets as an expression of the “success of the revolution,” via his official Twitter account, in anticipation of the military’s statement. 17:25 State news agency MENA reports that the police are handing out juice and water to anti-Morsi protesters in Tahrir Square. 17:20 Still no army statement, although some local television channels are broadcasting rumours that President Morsi has been put under house arrest, causing crowds in Tahrir to celebrate. 17:00 In Alexandria, the site of major clashes over the last week between pro- and anti-Morsi groups, thousands are now flocking to Al-Qaed Ibrahim Square in the city centre and to Sidi Gaber district to hold anti-Morsi rallies. There are also big crowds marching along the seafront. Police forces are hovering across several streets and squares to ensure security. 16:50 The president’s office issued a statement reaffirming Morsi’s commitment to the roadmap announced in his speech yesterday, which includes the forming of a coalition government and a committee to amend the constitution. 16:45 Tahrir Square is starting to fill up with anti-Morsi demonstrators, with the central square partially full while surrounding streets are still relatively empty. Thousands are also starting to flock to Alexandria’s Sidi Gaber train station to demonstrate. There are also reports of anti-Morsi demonstrators gathering in Sharqiya, Menoufiya, Port Said and Mansoura. 16:40 The rhetoric of the Islamist supporters at the Rabaa Al-Adawiya press conference was largely defiant, like President Morsi's speech last night. "We call upon all Egyptians to take to the streets and stand against the attempt to overthrow legitimacy," Islamist politician Magdy Hussein stated. He further asked protesters to raise their national identity cards as proof of them being Egyptian, claiming police chose not to protect them during the clashes on Tuesday night because they were told "you were not Egyptians". 16:30 The military's 48 hour deadline has now expired. The armed forces have said that they are meeting with religious, national, political and youth leaders now, and we're expecting a statement soon. 16:25 The National Association for Change (NAC), a pro-democracy umbrella group of liberal, leftists and Brotherhood activists formed in 2010 to coordinate opposition against Hosni Mubarak’s rule, has issued a statement warning all “foreign states, entities and institutes” against interfering in Egypt’s internal matters asserting that any attempts of intervention would be a de facto declaration of war on Egypt. The NAC also called on Hamas and other Arab groups to understand “the danger of interfering in internal matters, or the involvement in the complicated struggle between the people and the groups of local and global terrorism." Anti-Americanism has been a feature of some of the anti-Morsi protests recently, with some protesters arguing that the US is too close to the Muslim Brotherhood. A statement released this evening by Coptic rights group the Maspero Youth Union also warned the American people that their president and US ambassador to Egypt Anne Patterson support "a fascist group [the Brotherhood] that oppresses minorities." 16:25 Several miles away from the Ittihadiya presidential palace, a focal point of mass opposition rallies since Sunday, anti-regime protesters have started to congregate outside Egypt's defence ministry as the deadline of the military ultimatum draws nearer. The group of pro-army protesters have been holding a sit-in at the location for 12 days. 16:20 A press conference is underway by the Islamist supporters of President Morsi, the National Alliance to Support Legitimacy, at Rabaa Al-Adawiya mosque. "The president spoke to the people last night and explained the situation and outlined his road map for resolving the current crisis in Egypt,” a statement read by Magdy Hussein of the Islamic Labour Party said. "We are the constitution, we are legitimacy, we are freedom, we are revolution...Thirty years and the army didn't challenge Mubarak, it didn't go to war with Israel; but it challenges the legitimacy of the democratic president.... If the army enters politics it's the end of the constitution" said Hussein. 16:10 Ahram Arabic website reports that in a number of governorates, protesters are blocking roads and besieging governorate buildings in the run up to the military’s anticipated statement. In the city of Kafr El-Sheikh, protesters who have besieged the governorate headquarters announced they will keep doing so until Morsi resigns, announcing their rejection of recently-appointed Muslim Brotherhood governor Saad El-Husseini. In the Gharbiya city of Tanta in the Delta, members of youth protest groups shut the gate to the Gharbiya governorate headquarters with metal chains and prevented employees from entering the building in response to the call for civil disobedience by ‘Rebel’ campaign. In Menoufiya, hometown of former president Mubarak, a group of protesters blocked one of the city’s main roads. 16:00 Welcome to Ahram Online’s live updates. On Monday, the Egyptian supreme council of the armed forces responded to mass protests by issuing an ultimatum to political forces, saying that unless "the people's demands are met" within 48 hours, the army would impose its own roadmap. The 48-hour deadline will be up today at 4:30pm Cairo time. The army has said that there is no time set for its statement. President Mohamed Morsi and the group which he hails from, the Muslim Brotherhood seem entrenched in their position and reluctant to make any concessions. The opposition, including the anti-Morsi 'Rebel' campaign that spearheaded the 30 June protests, and the coalition group the National Salvation Front also show no sign of backing down. Rebel has nominated three of its organisers to negotiate on its behalf, while the rest of the opposition have put forward liberal politician Mohamed ElBaradei. Negotiations are currently going on between ElBaradei and different political factions. Head of the Brotherhood's Freedom and Justice Party Saad El-Katatni refused an invitation by the military to meet with ElBaradei. The Islamist supporters of the president are expected to hold a press conference soon. There were initial reports that key Morsi allies Al-Gamaa Al-Islamiya were calling on President Morsi to hold a referendum on early presidential elections, but the group has denied this. The interior ministry released a statement saying that it will stand "side by side" with the army, and will address any violence. 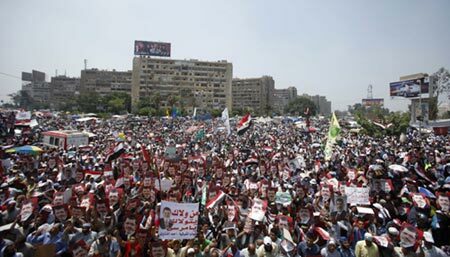 There are still tens of thousands of Morsi supporters camped out at Rabaa Al-Adawiya Mosque in Cairo's Nasr City, and a similar number of anti-Morsi protesters in Tahrir Square. There is also an anti-Morsi gathering at Ittihadiya presidential palace in Heliopolis. well now he can fight for his life in front of a court. I just hope Egypt will come to peace again after two selfmade Pharaos. the army and terrorist opposition have brought this back with a different name. Corrupt judges of Mubarak are thinking mission accomplished. Not until you are brought forward to the Lord of the worlds with your evil accounts. You stated, "The army has said that there is no time set for its statement." They set a time limit of 5:00 pm for Morsi to make a decision or they would produce a political "road map" for Egypt. Did you mean something else?